McHarry’s Buslines is one of Geelong’s born and bred success stories. It is a family owned and operated business and has been for over 85 years. Continually improving all that we do has enabled us to become a part of the daily lives of generations in this region. a range of school and adult charter services. This ranges from music festivals, conferences, Senior Citizen outings to Weddings etc. services between Geelong, Lorne and Apollo Bay via the Great Ocean Rd. The road signs which point the way to our destination are summarised by the 3 ‘S’ phrase. Each ‘S’ takes into account the 3 main stakeholders in our business – Customers, Employees and Shareholders. To be the business that customers turn to when seeking public transport services in the Geelong Region. To be a family owned and operated enterprise that is respected by customers as trustworthy and highly capable in all that we do. We have a long history of involvement and support to our regional community. Our employees and customers live and operate within these communities, and so it is important for us to give back. Where possible, we source local products and services. McHarry’s also support a number of local charities and schools in the region. We have had a long association with ‘Give Where You Live’ (GWYL) at both the corporate and employee level. Many of our employees contribute to GWYL through their workplace giving program. Likewise, we have been a supporter of the Geelong Community Foundation for a number of years. Both of these organisations play an important role in helping those requiring extra assistance in the community. A number of our employees are members of emergency service organisations, and as a measure of support to these employees and their communities, the company provides leave to attend emergencies such as bushfires and floods. For more information on our approach to our employees, see our careers section. As a 4th Generation business, operating in a way that supports a sustainable community is something we value. To this end, we have adopted a number of measures that support sustainable environmental practices. Rainwater harvested from our rooftops is used in the washing of buses. This saves over ½ million litres of town water every year. We also operate rooftop solar with 375 panels collecting sunlight throughout the year. This renewable source of electricity supplies 1/3 of our total electricity requirements each year. Our vehicles operate to the latest emissions standards relevant to that vehicle. Our newest vehicles operate to the Euro 5 standard. This Euro 5 standard aligns Australia with the global standards developed by the United Nations. To optimise the operation of their vehicles, our drivers are trained to minimise fuel consumption and unnecessary idling. Lastly, use of skylights and LED lighting throughout our facilities all assist with reducing our carbon footprint. McHarry’s Buslines is accredited by Transport Safety Victoria under the Bus Safety Act 2009 (Vic) to operate bus services in Victoria. We are regularly audited by Transport Safety Victoria to ensure compliance. To provide peace of mind to customers, all employees have Working With Children Checks and have been trained in Child Safe Standards. The origin of McHarry’s Buslines Pty. Ltd. goes back to 1932, when John McHarry (Grandfather of the company’s current managing director who is also named John McHarry) was working at the Geelong Plant of the Ford Motor Company of Australia as a master builder. He carried his own employees to the plant in his work truck, and it wasn’t very long before he was inundated with requests from the Ford workforce for a ride to work. As there was an obvious demand for a passenger service to Ford, Mr. McHarry decided that it was time to purchase a bus. The Victorian Railways were calling for tenders for the sale of an International bus which they owned and Mr. McHarry was successful in tendering for this. Soon afterward he purchased a second bus; a Republic, to help cater for the heavy demand on the Fords run. McHarry’s first route service was to Highton, but due to poor patronage it was sold to local identity Hec Drew. In later years this service was bought by Corio Buslines and eventually taken over by Bender’s Busways when it took over Corio Buslines. Due to continuing growth of the business, John’s son Norman joined him in 1933 and bought his first bus which was also an International. He ran to Ford to assist his father and in the same year a White and a Ford were purchased to cope with the demands of the Ford patronage and the ever increasing popularity of trips to seaside resorts. In 1935, Norman McHarry married and his wife Alice became active in the business and together they built it up with the addition of a Tilling-Stevens in 1936 and two more Fords in 1937 and 1938. Tragically, in 1940, company founder John McHarry was killed in an accident at the depot. December 1951 saw the McHarry operation amalgamate with Green Star Passenger Service, which had routes operating to seaside areas, and Corio Buslines, who were operators of the Highton and West Geelong urban routes. The Group became known as Geelong Associated Buslines. In the same year the East Geelong/Breakwater route service was purchased from the Kenny family and it is from this service the Whittington, Breakwater & St. Albans Park extensions were developed to what they are today. The company’s involvement with Geelong Associated Buslines didn’t last long. In 1953 it was decided that the three operators would return to individual operation and that the Lorimer family (Green Star) would continue in the name of Geelong Associated Buslines Pty. Ltd. In the ensuing years, Norman and Alice McHarry were successful with several tenders for Education Department school contract services and in 1965 it was decided that as Corio Buslines had been sold to Bender’s it would be prudent to purchase Corio’s premises in Catherine Street Geelong West. McHarry’s Kooyong Road Depot was beginning to “burst at the seams”. Fifteen years after parting from Geelong Associated Buslines the McHarry’s decided to purchase the operation and in doing so doubled the fleet to 36 vehicles. McHarry’s next expanded, doing camping tours into the Outback but after Norman McHarry’s untimely death in 1975, it was decided that the company would scale down its touring operations. Already in the business for some years, Norman McHarry’s son John and daughter Corinne were left to assist Mrs. Alice McHarry in continuing the operation of the family business. Later John’s wife Lyn joined the firm to assist in the clerical side. 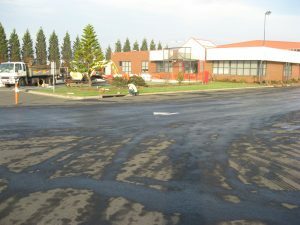 In January 1984, the company purchased the busy East Geelong and West Geelong services as well as nine Education Department school contract services from Trans Otway Ltd. This added another 17 vehicles to the fleet. The company was also able to secure the head lease of the Trans Otway bus terminal in Ryrie Street from which it continued to operate its newly acquired and existing urban services and allowed for the provision of much needed parking space for other vehicles during the day. But with the continued expansion of the business, even the addition of the Ryrie Street terminal and depot wasn’t sufficient to cope with the growth of the fleet, so it was decided to move the company’s 67 buses and 86 employees to a new depot where operational, maintenance and administrative requirements could be concentrated, thus improving the overall efficiency of the company’s various activities. The move was made in October 1988 to an 8 acre (3.2 ha) site at Breakwater where there is ample room for further expansion. The move showed a great deal of foresight because in July 2000, the company purchased Bellarine Buslines and Advance Coaches, a further 49 buses increasing its fleet size to 125, now by far the biggest bus company in Geelong. The acquisition meant that it now operates services across the entire Bellarine Peninsula, and the V/Line Passenger Service between Geelong and Apollo Bay, and also Apollo Bay to Colac . In addition to the urban services provided under the Geelong Transit System network operation, McHarry’s Buslines have services grouped under the title of Bellarine Transit and which co-ordinate with V/Line trains at Geelong and run beyond the urban grid to and from Barwon Heads, Clifton Springs, Drysdale, Ocean Grove, Collendina, Portarlington, Point Lonsdale, Queenscliff, Torquay, Jan Juc, St. Leonards, Indented Head, and the V/Line Service; Anglesea, Lorne and Apollo Bay. 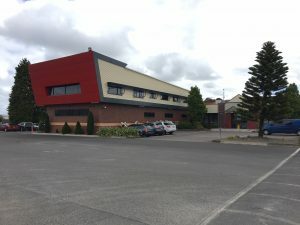 In the 1990’s John McHarry’s two children and fourth generation family members Ashley and Lisa McHarry became involved in the business; Lisa in an administrative role, and Ashley first as an apprentice motor mechanic, then Operations Supervisor and currently as General Manager and Director. Significant upgrades to the Geelong route network over the years 2009 – 2016 required major changes to our fleet and workforce to provide the additional services. During this time, new private school contracts were also won. In 2009, Breakwater depot saw expansion of our administration building, and the inclusion of a new ‘health centre’ complete with fully equipped gym and personal trainers. 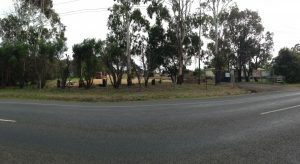 The Company purchased 3 acres of land in Murradoc Rd. Drysdale with a view to developing a new depot. The aim was to relocate from land which was leased in Portarlington and to provide a base for future growth of the Company. 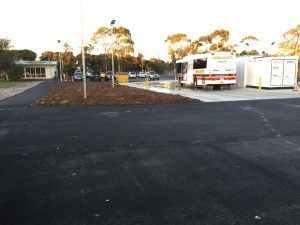 The new depot was opened in 2015 after land planning and site development works. McHarry’s now employ approx 275 people and operate 200 buses, and will remain a proud family owned and operated business for many years to come. We continue to make significant investment in our facilities, fleet, and the training & development of all employees to deliver the safety and service expected of us.